One of my favorite food pastimes is encountering an excellent dish at a restaurant and then trying to recreate it at home. Recently, such a challenge presented itself at Zoe in Little Silver, NJ. The picture on the left is the version we were served at Zoe. The picture on the right is my version. Zoe is our local little secret. It is an intimate gem of a restaurant tucked inside a tiny strip mall in the center of town. The owners of the establishment bill themselves as “The Bistro Boys” paying tribute to their original restaurant, The Bistro, in Red Bank, NJ. We have been to Zoe over a dozen times and have yet to be disappointed. 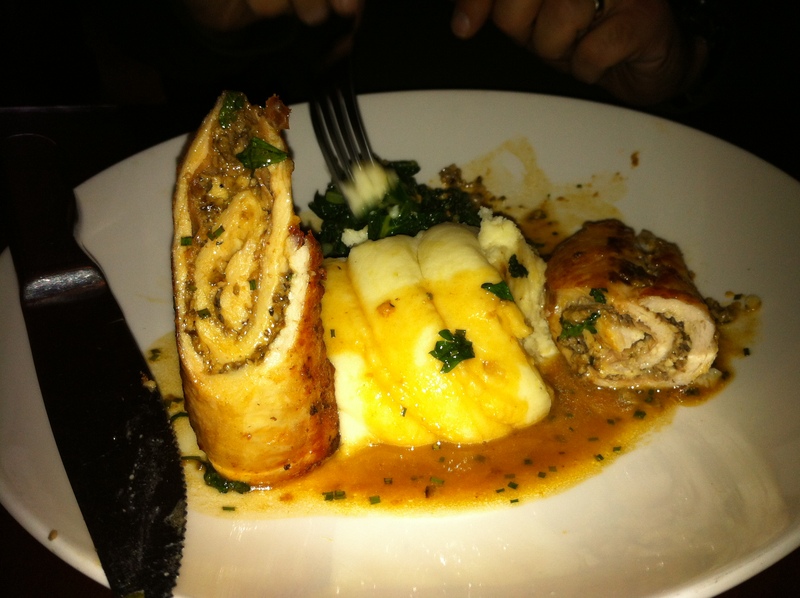 It features a small, well-conceived menu featuring Mediterranean-influenced cuisine (Italian and Greek). The entrees are reasonably priced and the daily specials usually reflect seasonal market availability. Recently, one of these specials sent me clambering into the kitchen with the hopes of replication. 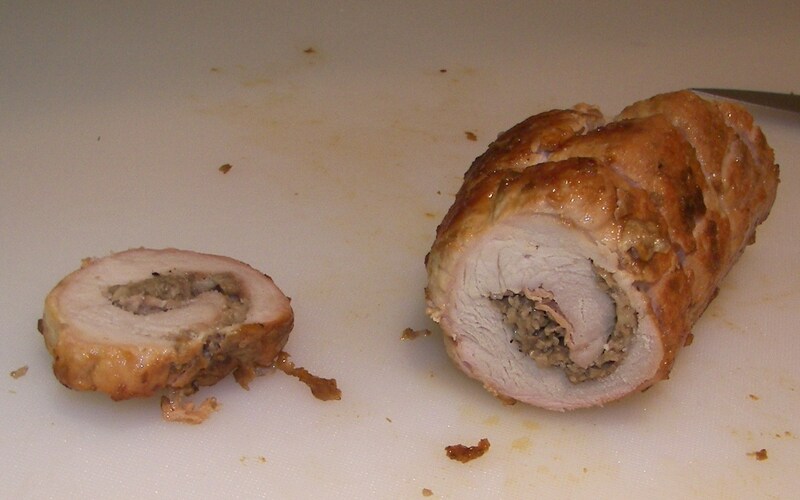 It was a rolled loin of Pork stuffed with Prosciutto, Mushrooms, and Fontina Cheese. My attention was piqued when the waitress described the dish. Janine beat me to it when it came time to order. We share the same tastes in food and usually desire the same entrees. Being a gentleman, I always yield and let her order first. Then wind up scrambling at the last minute to choose something else when she orders what I had planned. This time, I definitively said; “I’ll also have the Pork loin special” hoping it was the right choice. 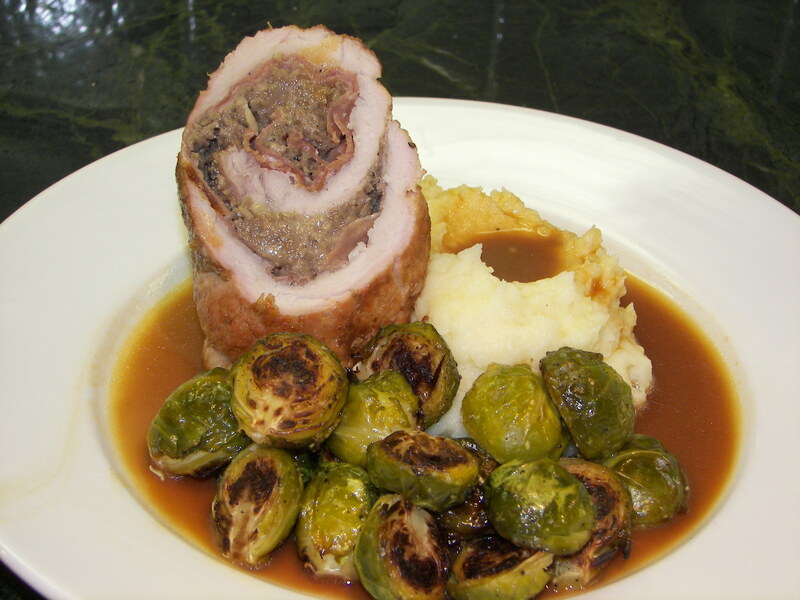 Selecting Pork as an entrée in a restaurant can be similar to playing the Lottery. You place your order filled with optimism, only to be disappointed with the results. Zoe’s interpretation of this classic dish proved to be a winning ticket. It was served moist and succulent. 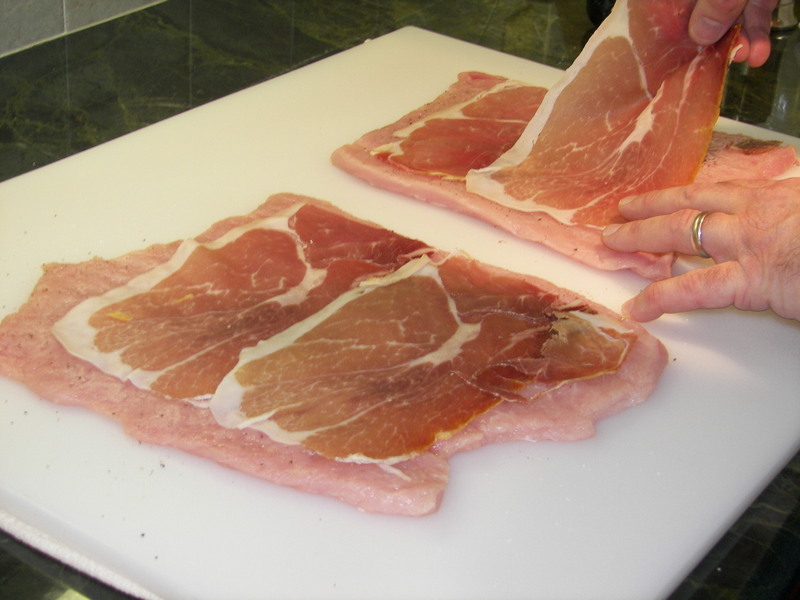 The Prosciutto’s ribbons of fat rendered during cooking process and basting the loin from the inside out. An earthy note was added by the mushrooms and the melted Fontina held it all together. Janine suggested we try to make it at home after the first bite. I nodded in agreement to avoid talking with my mouth full. Our version was a yeoman’s effort but lacked some of the refinement of the original. An honest critique would include the following observations. Zoe’s portion was appropriate for the plate. Ours tended to be larger. The size difference can be attributed to the cuts of pork that were used. We used a center-cut loin. Zoe may have used the tenderloin. Ours was flavorful and somewhat moist, but just slightly overcooked for my tastes. I prefer it medium rare. Janine prefers it medium well. I removed the loin from the oven when the internal temperature reached 160 ⁰. Next time, I will remove it at 155⁰ and let it come to temperature as it rests. If time allows, I will also brine it beforehand. Our sauce was adequate at best. It was balanced and rich, but nothing special. Zoe’s sauce was far more refined. Unfortunately, I didn’t have any homemade Veal stock on hand (Believe or not, I actually make this from time to time). Reconstituted store-bought demi-glace was substituted. The final result tasted a little vegetal to me. We had a lot of fun preparing this dish. Although Zoe’s version was far more polished, the experience gave us the chance to spend the afternoon in the kitchen together and share a nice meal afterward. Cooking for us is a work in progress. We learn as we go. Feel free to send us any comments, suggestions, or criticisms you may have. Thank you. The complete recipe is provided below. Clean mushrooms thoroughly (I use a pastry brush for this and simply brush away any dirt that clings to the mushrooms). Chop mushrooms to a fine dice. This might seem like a lot of mushrooms but they cook down and release their moisture when sautéed. Heat oil and butter in a pan over medium high heat. Add mushrooms and sauté until they release all of their moisture (The pan will look a little soupy at this point). Season lightly with salt and pepper (Remember, both the Prosciutto and Fontina have high salt contents. You don’t want the final product to be too salty). Continue cooking until excess moisture is evaporated. Stir often. Note: I use vegetable oil here instead of olive oil because it has a higher smoking point. Olive oil can be substituted without fundamentally altering the dish. Just be conscious of your heat level. If the oil starts smoking, lower the heat. 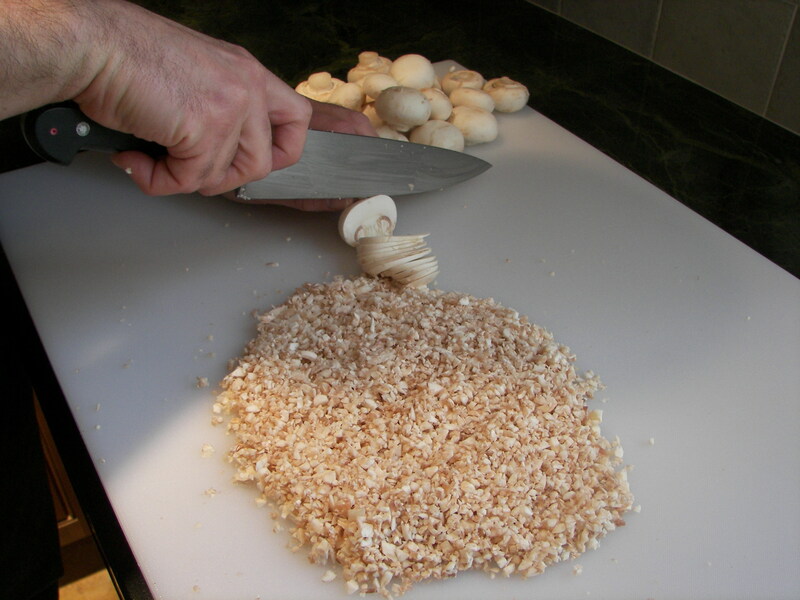 Remove mushrooms from pan when excess moisture has evaporated and set aside. Shred the Fontina Cheese through the large holes of a box grater. When the mushrooms have completely cooled, mix half the shredded Fontina cheese with the mushrooms. Taste the mixture. Add salt or pepper to suit your personal preferences. 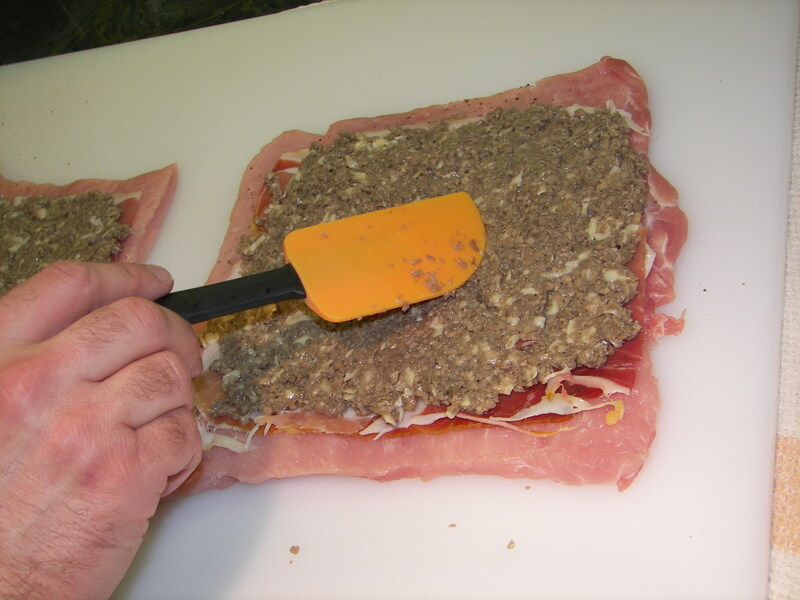 Set mixture aside while you prepare the Pork Loin. 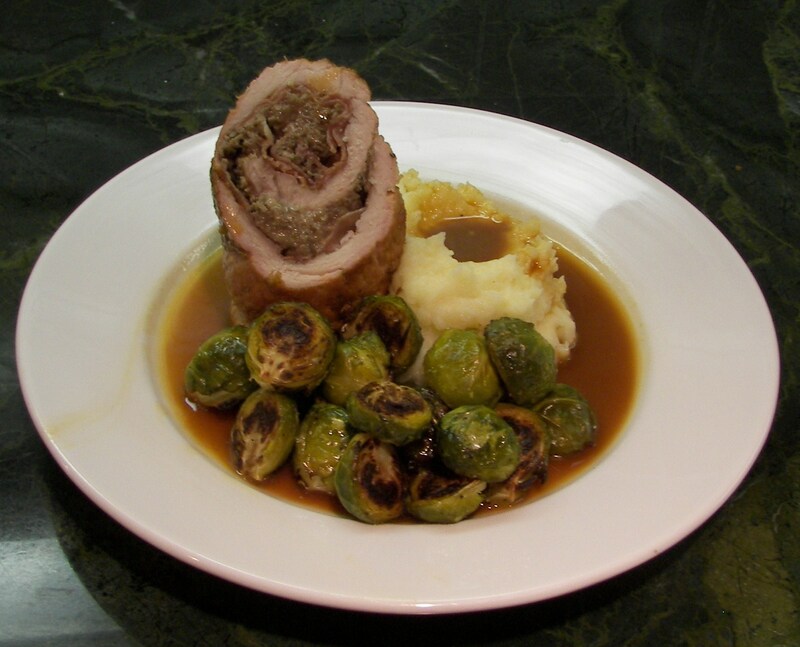 For this recipe, the pork loin will have to be butterflied. Essentially, this process will “unroll” the loin into one long thin piece. Each slice of the knife frees another section of the loin, enabling it to unroll like a scroll of parchment. Preheat oven to 375 ̊. Trim off all fat and silver skin. 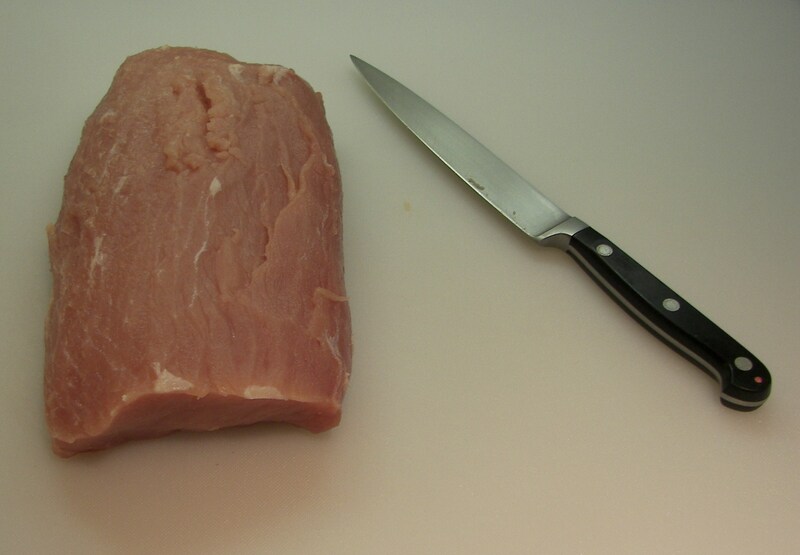 Position the loin on a cutting board so the length of the product runs vertical to where you will stand when you cut (The loin should look like this when it is front of you “ I ” not this “ ̶ “ ). Beginning at the top of the loin, cut a flap down the entire length of the loin. 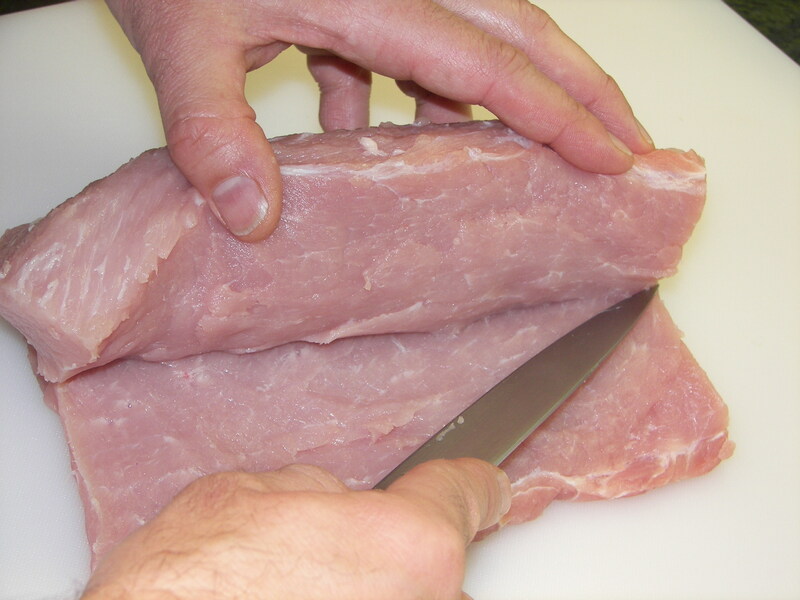 The flap should be about ½” thick and end about a ½ from the opposite edge of the loin. (While cutting, the flat side of the knife should run parallel to the cutting board) . Note: Be careful not the cut all the way through the back edge. The intention is to unroll the loin in one piece, not cut individual scaloppini. Unroll the remaining portion or the loin. Make a similar cut as before. Continue this process until the entire loin rolls out to on long thin piece. Lay a length of plastic wrap over the loin and pound thin with a meat tenderizer (I use the bottom of a small frying pan for this). Remove the plastic wrap (The loin can be cut into two sections if you prefer. This will yield two stuffed rolls when done). Season lightly with salt and pepper. Cover each piece of loin with two slices of Prosciutto. 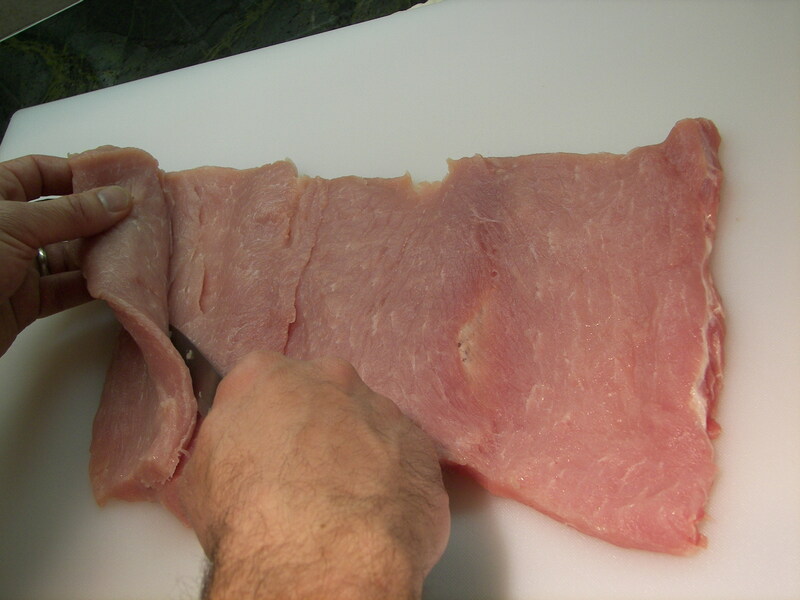 Make sure the slices to do not drape over the edges of the loin. Leave about ¾” between the edge of the Prosciutto and the edge of the loin. Spread a thin layer of the mushroom/Fontina mixture evenly across the prosciutto slices. Note: Do not spread the mushrooms in the ¾” of space between the edge of the Prosciutto and the edge of the loin. This will create a uniform seal around the edges when you roll the loin up. Sprinkle the remaining cheese over the mushroom mixture. Roll the loins up, tucking the edges in as you go. Truss each loin with butcher’s twine. Heat a large frying pan over medium high heat. Add vegetable oil. Shake pan gently to distribute oil evenly over the bottom. Sear loins gently on all sides until lightly browned. Place pan in preheated oven. 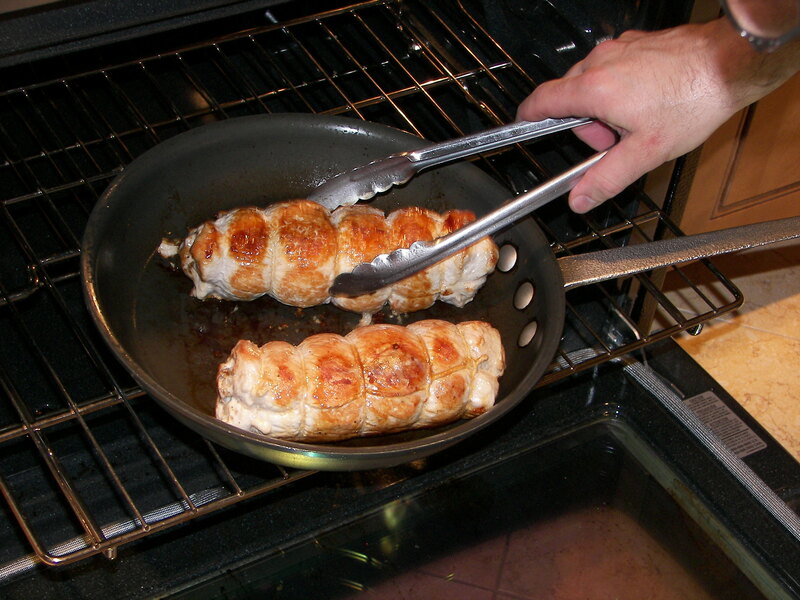 Turn loins periodically to ensure even browning on all sides. Hint: Add a little stock to the pan if the loins become too brown or the drippings on the bottom of the pan start to burn. Remove loins from pan. Keep them warm while they rest. Remove excess grease from the pan used to roast the loins. Note: I accomplished this by placing the pan over high heat on top of the stove. This causes the excess moisture to evaporate and the meat proteins (sucs) to adhere to the bottom of the pan. The excess grease can be easily poured off once this occurs. Make sure you don’t lose any of the sucs. These will greatly enhance the flavor and depth of the sauce. Be careful not to burn the sucs. This will make the sauce bitter and unpalatable. Add shallots to hot pan. Stir a few times to prevent them from burning. When shallots become translucent, add wine to the pan. Reduce by half, scraping browned bits off the bottom. Add stock. Continue scraping brown bits off bottom. Note: I used store-bought veal demi glace reconstituted to an 8 to 1 ration. The package recommended 4 to 1 for classic demi. I diluted it to create a rick stock. Prepackaged Chicken, Beef, or Veal stock could be used here. I would reduce it slightly beforehand to concentrate the flavor before adding it to the pan. Be conscious of the salt content when doing so. The salt will be concentrated along with the flavors. Sometimes adding a little mire poix (chopped Onions, carrots, and celery) will help remove some of the salt when you reduce it. After the stock simmers for a few minutes, strain it through a fine mesh chinois or small strainer lined with cheesecloth into a small saucepan. Bring mixture to a simmer in the small sauce pan. While stirring, add the arrowroot slurry one drop at a time. 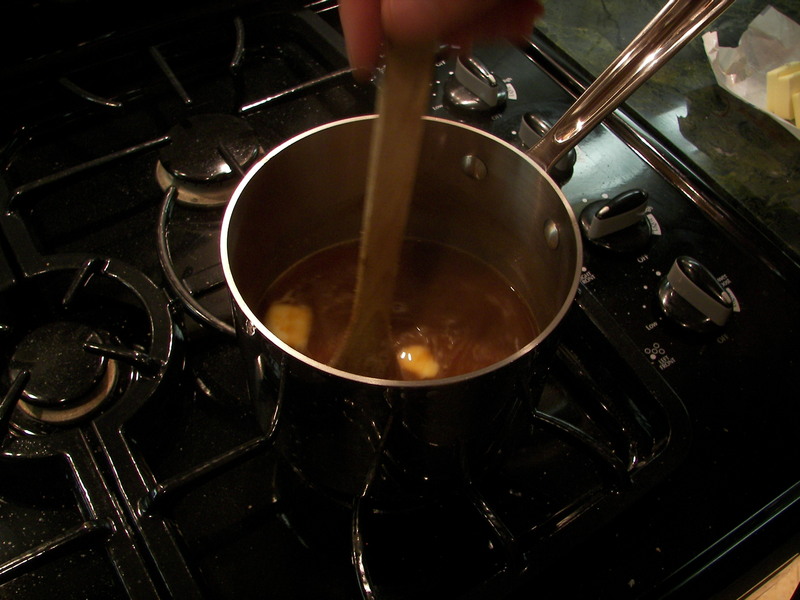 Continue stirring while adding drops of Arrowroot until the sauce napes the back of a spoon. Note: Don’t use too much arrowroot or else the sauce will be too thick. It can be eliminated entirely, but I find a touch of it helps prevent the sauce from breaking after the pats of butter are stirred in. Taste the sauce. Season with salt and pepper accordingly. When the sauce reaches the desired consistency, lower the flame to the lowest setting possible and stir in the butter one chunk at a time. Taste the sauce after each chunk of butter is incorporated. Continue adding butter until the sauce is rich, velvety, and the acidity is balanced. Note: Do not allow the sauce to return to a boil. It will cause it to break. When this occurs, pools of melted butter will float on top. Remove butcher’s twine from loins. Slice according to your tastes. Pour sauce on a place. 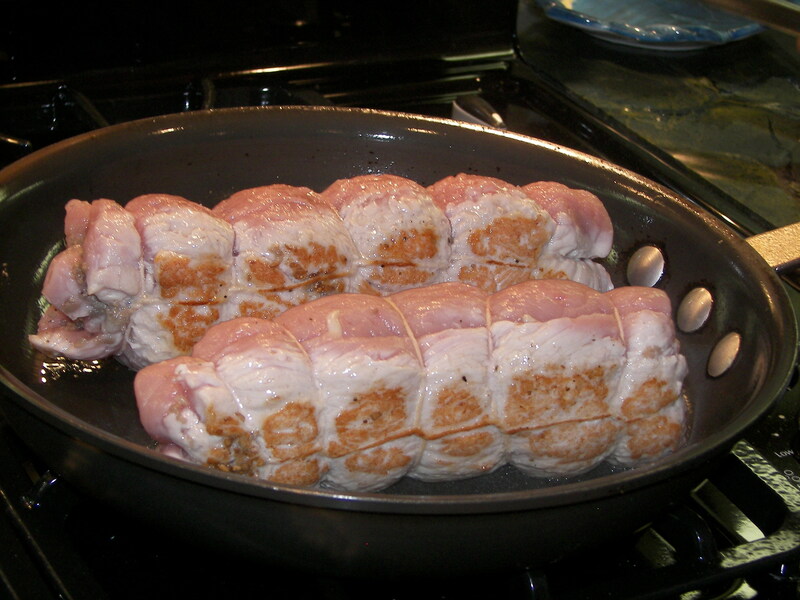 Place slices of loin on top. Other favorites at Zoe include the short ribs, salmon, chicken souvlaki and penne vodka with chicken. Seasonal dinner specials are always delicious and sell out quickly. The black and white bread pudding dessert is fabulous! Note: Zoe is BYO.